There are so many ways to feel the actual effects of cigarette smoking, but vaping is one method that has gained significant momentum over the years. Vaping is growing exponentially owing to this quick-acting alternative to smoking which has proved to be a healthier and safer way to enjoy cannabis. Vaping is short for vaporization and generally refers to as the practice of inhaling vapor produced by specialized devices such as electronic cigarettes (e-cigs) or vape pens or advanced personal vaporizers. There are so many variations of e-cigarettes ranging from simple resembling a cigarette to large vaporizers. They serve essentially the same purpose – to ensure you get the same pleasant experience without banking on the harmful effects of smoking. Let’s take a closer look at the two most common methods of cannabis smoking – e-cigarettes and vaporizers. Electronic cigarettes, commonly referred to as e-cigarettes, are the newest way to vaping that mark the end of smoking tobacco. It’s a new smoking alternative specially designed to look and feel like a real cigarette. There are many variations of electronic cigarettes ranging from traditional e-cigarettes to advanced personal vaporizers such as vape pens, all of which are essentially the same. In its most basic form, an e-cigarette is a battery-powered device designed to emit vapors that can be inhaled afterwards. Typically, there are two types of e-cigarettes used: manual and automatic. Vaporizers, or commonly referred to as vapes, are the more advanced and the newest way to enjoy cannabis by vaporizing substances for inhalation. It’s one of the many ways to vaping using specialized devices such as e-cigarettes, vape pens, and advanced personal vaporizers (APVs). Vaping is for former smokers who are still trying quit smoking or at least looking for potential alternatives to smoking tobacco minus the adverse effects. Over years, vaping has grown exponentially to become the safer alternative to smoking cigarette. E-cigs or electronic cigarettes, in its basic form are simply a combination of rechargeable lithium battery and disposable e-liquid cartridges. Electronic cigarettes are considered one of the best alternatives to traditional cigarette smoking and often referred to as personal vaporizers. They are designed to imitate the look and feel of a real cigarette and even emulate the operation. Vaping, on the other hand, is quite similar to the act of smoking except vapor products are a little larger than electronic cigarettes. Vaping banks on vaporizers to get you enjoy the pleasures the smoking without the effects. An electronic cigarette is a battery-powered device designed to emit vapors that can be inhaled afterwards. The battery is attached to a heating element called an atomizer and a cartridge that holds the nicotine and other liquid and flavorings. In most e-cigarettes, the atomizer and the cartridge are combined into one device called a cartomizer. The battery then powers the atomizer to vaporize the liquid and the contents of the liquid create the ultimate emission. 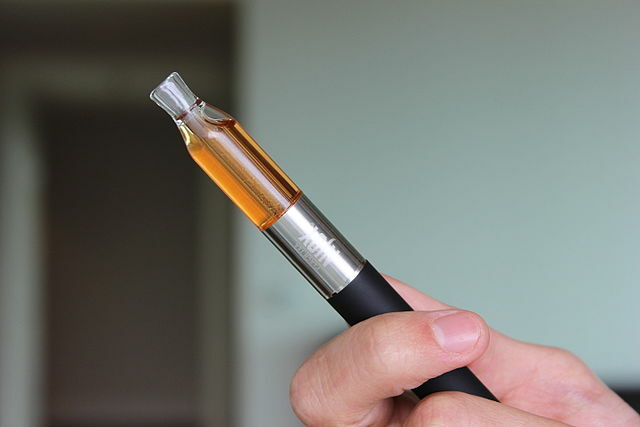 Vaporizers are virtually indistinguishable from electronic cigarettes and unlike e-cigs, they use a tank rather than a cartridge to hold the e-liquid. There are so many different models of electronic cigarettes available on the market but they all are categorized into three main types: Minis, Vape Pens, and Advanced Personal Vaporizers (APVs) or Mods. One of the most common vaporizers used is a pen-style handheld device called a vape pen which uses a button to activate the heating element. Minis are compact and lightweight e-cigs and a low-cost alternative to smoking which is available in both disposable and rechargeable models. APVs are the next generation of e-cigarettes that are designed for maximum vapor production combined with an extended battery life and other features to provide you the best smoking experience. Electronic cigarettes use pre-filled cartridges so they do not accommodate a wide variety of e-juice flavors and manipulating the device to add more flavors is a little tricky. They mostly use menthol, tobacco, and mint to imitate a real smoking experience. Advanced vaporizers are the newest addition to the conventional e-cigarettes that bring you a wide assortment of vape flavors including tobacco, menthol, fruits, desserts, beverages, etc. They can mix and match e-juices to create personalized vape e-cigarettes tailored for their tastes. Unlike e-cigarettes, vaporizers don’t need cartridges thereby reducing the effects of smoking. The battery portion of an electronic cigarette often has LED attached to the tip which comes in a variety of sizes. Typically, larger the battery, the longer the battery life. 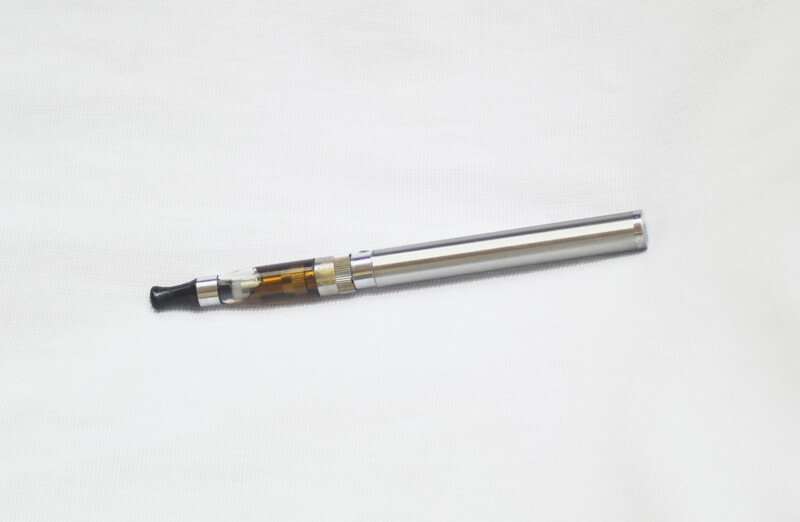 In common all-in-one e-cigarettes, battery is usually the part onto which the e-liquid delivery systems are attached. However, not all e-cigs are rechargeable. In advanced personal vaporizers, rechargeable batteries are used that can be removed from the Mod to charge it or replace it with an already charged battery. Mod is a large e-cigarette with a removable battery. Traditional e-cigarettes have non-removable batteries. It’s hard to imagine how electronic cigarettes have evolved from traditional cigalikes to the advanced vaping devices of today. E-cigarettes have undoubtedly come a long way since the first non-tobacco smokeless cigarette came to the picture. Despite being new to the scene, the e-cigarettes market is doing relatively well. And now with the more advanced vaporizers into the league, vaping turns out to be the closest near-smoking experience you’ll ever have. As it turns out, vaping is as close you can get to enjoy cannabis in the form of vapor or aerosol. But, not all e-cigarettes are created equal. So if you’re looking for a healthy smoking alternative, choose wisely. Sagar Khillar. 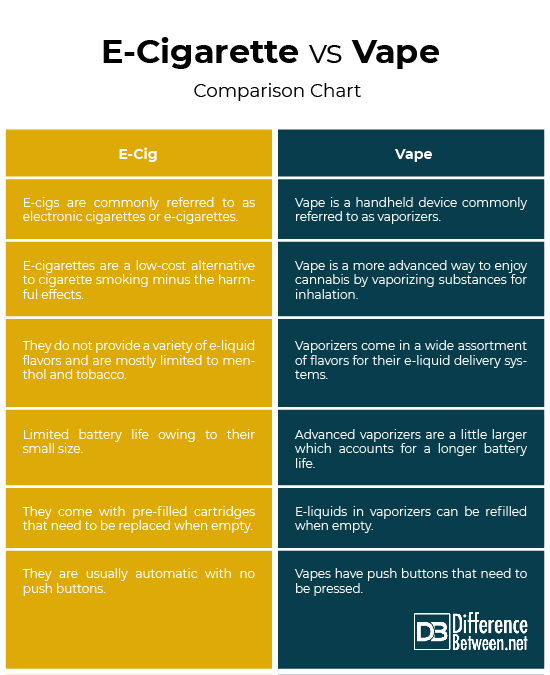 "Difference Between E-Cigarette and Vape." DifferenceBetween.net. March 1, 2019 < http://www.differencebetween.net/object/difference-between-e-cigarette-and-vape/ >.